OSWEGO, NY – Big John Sales and NTI Boiler have combined to make the Greater Oswego-Fulton Chamber of Commerce Annual Spectacular the hottest ticket in town. Thanks to their sponsorship, golfers in this year’s Chamber golf tournament will the have the chance to win $1,000,000. 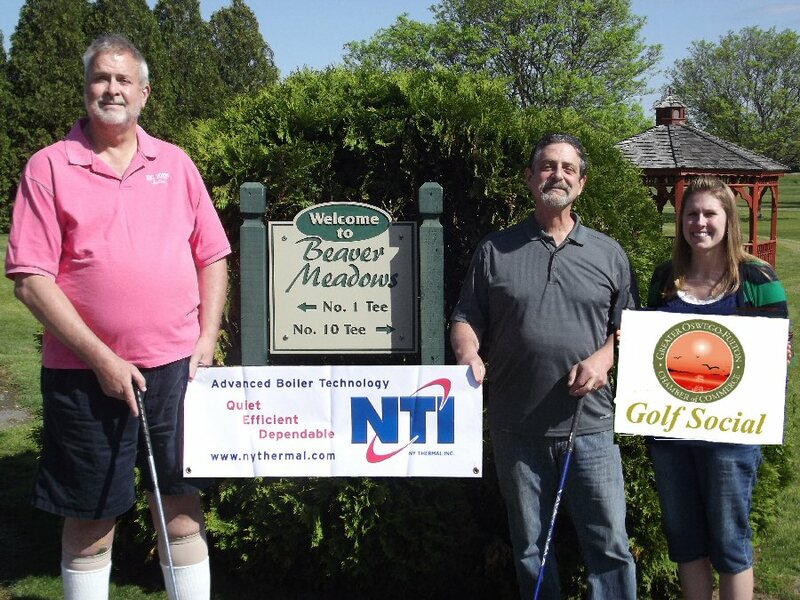 Chamber member services associate Jackie Thorpe meets with John Zanewych of Big John Sales (left) and Ted Lowe of NTI Boilers to discuss the details of the $1,000,000 Hole-In-One Contest taking place during the Greater Oswego-Fulton Chamber of Commerce Annual Golf Spectacular. Every golfer will have the opportunity to be one of four finalists that will have a shot at the $1,000,000 prize. The two male golfers, and the two female golfers who are closet to the pin on the designated $1,000,000 hole will comprise the four finalists that will have a chance to tee off for the $1,000,000 hole-in-one. John Zanewych of Big John Sales and Ted Lowe, regional manager for NTI Boiler are looking forward to the possibility of congratulating a $1,000,000 winner. Scheduled for June 16 the 2014 Greater Oswego-Fulton Chamber of Commerce Golf Spectacular will feature a four-person captain and crew format and tee off at 10 a.m. at Beaver Meadows Golf Club, 185 Barnard Drive in Phoenix. In addition to the $1,000,000 Hole-In-One Contest the Chamber Golf Spectacular includes hole-in-one contests for a chance to win a 2014 Chevrolet Equinox courtesy of Burritt Motors in Oswego and chance to win $10,000 courtesy of the Fitzgibbons Agency; chipping and putting contests; prizes for longest drive, straightest drive, closest to the pin; and a skins game. Emmons added that the excitement surrounding the event has led to another unprecedented decision. For the first time in its history the Greater Oswego-Fulton Chamber of Commerce Golf Spectacular will be open to non-chamber members. “We welcome all interested community members to join us for a enjoyable round of golf on the beautiful course at Beaver Meadows Golf Club and a chance to win some amazing prizes including $1,000,000!” said Emmons. The chamber is currently accepting registrations for members and non-members wishing to play in the 2014 Chamber Golf Spectacular. An entry fee of $450 for chamber member four person teams and $550 for non-member teams includes green fees, cart, lunch, and a full steak dinner following the event. Registration is limited and team spots will be filled on a first come, first served basis. A variety of sponsorship levels from tee signs to contests are also available for businesses and organizations wishing to be a part of the Chamber Golf Spectacular.